With all of that said, let’s begin with the offense, the side of the ball that looked a little rosier in the Early Signing Period than it does at the end. Much like Matt Fink, it would be something of an upset if Slovis becomes a starter at USC. If he does, it probably means something went wrong with both of J.T. Daniels and Bryce Young. That is totally fine. As I alluded to in the intro, no elite quarterback was going to try their luck at USC in between the two Mater Dei products, because this no longer a thing elite quarterbacks do anymore. The only school to buck this recent trend was Georgia, who nabbed Jacob Eason, Jake Fromm and Justin Fields in consecutive classes. Eason and Fields have since transferred, which says everything you need to know about how likely it is to happen elsewhere sometime soon. But healthy programs have quarterback depth, and depth comes in many forms. To put it in USC-centric terms, you want a Sam Darnold but also a Garrett Green, someone who can stick around for the long haul, know the system comprehensively, put in yeoman work on the scout team and do a professional job if an injury arises so no one’s redshirt gets burned. That’s Slovis’ trajectory. Relative to what USC needed and realistically could sign here, he’s a nice get. Kenon Christon is a beautiful complement to what USC already had in the backfield, a straight-line burner with the type of speed that doesn’t ordinarily come in a 5-foot-10, 185-pound frame like his. He’s in the tier of Southern California running backs just below Zach Charbonnet, and the sort of player who USC takes any year. The problem is there aren’t two of him. 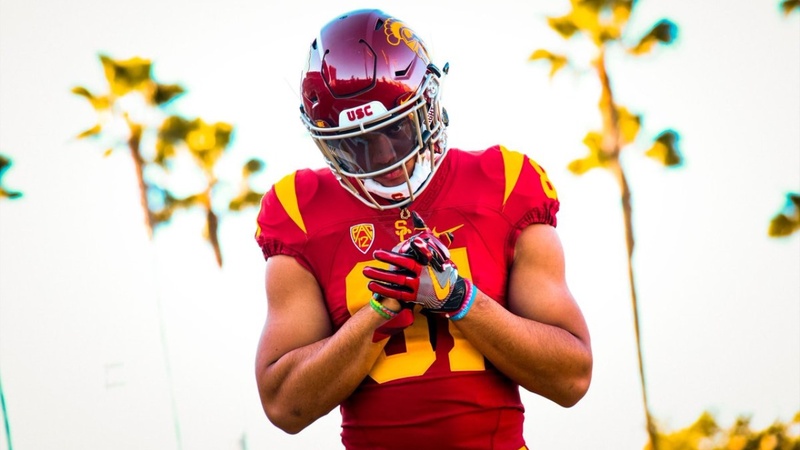 With Stephen Carr and Vavae Malepeai both draft-eligible after next season and only four backs on the roster total, the Trojans desperately needed to sign a second running back in this class. Mike Jinks deserves credit for cultivating several out-of-state options in a very short period of time but USC still missed hard when they couldn’t afford to and this grade reflects it. Arguably the wide receiver class in the country splintered apart in two short weeks with Bru McCoy‍ transferring to Texas and Puka Nacua‍ presumably out the door as well. Still, this is a strong group and one that keeps USC in really good standing at the outside positions. Ford is a star, London has massive upside and McClean is plenty long, plenty athletic and will arrive two years removed from an ACL injury. This group was an easy A+ before McCoy’s decommitment and a solid A afterward. So this reflects a unit that’s very talented but missing a slot receiver who would re-establish ideal balance after an offseason of attrition. On talent alone, USC did really well here, signing the top two tight ends in the state in a year when they absolutely needed both. Wolfe is perhaps the most complete player they’ve brought in at this position in years, a massive 6-foot-6 with soft hands and the frame to take on defensive linemen in the blocking game. He should be starting in Graham Harrell’s two tight end sets within two seasons. Here’s the major letdown of the recruiting class, and a place where the meager on-paper results are made even worse by the context surrounding them. Last year, USC signed two offensive linemen in February – junior college offensive tackle Bernard Schirmer later joined the team in fall camp – largely due to a very weak class on the West Coast. That wasn’t as disastrous as it seemed thanks a stellar crop of talent in talent 2019. The thought was that USC could load up with as many as five players to offset their light 2018 group, which would also insulate them in case more prospects don’t emerge in the 2020 class, which, to date, is closer to 2018 in quality than 2019. You know what happened next. USC nabbed one of its top priorities in Jason Rodriguez, then proceeded to strike out over and over and over again on everyone else – Sean Rhyan, Jonah Tauanu’u, Troy Fautanu, Nathaniel Kalepo, Sama Paama and, finally, Enokk Vimahi plus out-of-state region tackle Dawand Jones on the late signing period. They couldn’t even nab an endgame consolation prize in Hunter Hill, who signed with Utah State. This stings on several levels. For starters, USC is at least one and probably two bodies short on the offensive line a year removed from graduating three-fifths of its starters. The lack of depth is especially pronounced at offensive tackle, which only featured four full-time players – utility lineman Liam Douglass could be a fifth – prior to this signing period and none who were younger than a redshirt sophomore. Neither Livai nor Quinones project to play the outside, which now makes Rodriguez possibly the most important recruit in this class. Simply put, he has to pan out as a right tackle – we won’t get into how much it hurts that, for two classes running, there’s no potential left tackle – or else the cupboard could run dangerously bare if Austin Jackson, who will be draft eligible after next season, opts to turn pro. It’s an unfair position to put Rodriguez in, because offensive linemen are notoriously difficult to project out of high school. For that matter, it’s an unfair position to put the entire class in, because missing on so many top targets practically makes it incumbent on all three players to succeed in varying degrees, or else the Trojans will feel a depth crunch sooner than later. Tim Drevno is the type of teacher who can make that happen but Quinones in particularly will need more development time after spending most of his high school career on defense and one has to wonder how much he’ll now be afforded. It’s a mess that USC just shouldn’t be in and it’s the sort of trend that can’t just reverse itself in one year, either. Point blank, this has now become the biggest positional worry on the entire roster moving forward.